Machine peeled posts have a rough surface. 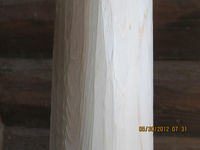 Machine hewn posts have a smoother surface. 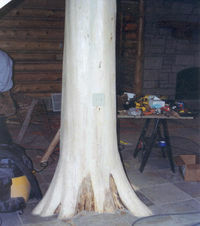 The maximum diamter of a machine hewn post is 8". 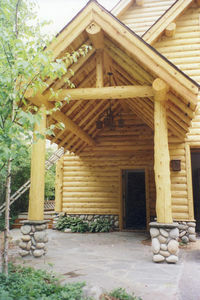 Hand hewn posts can have diameters greater than 8" and have an old fashion look. 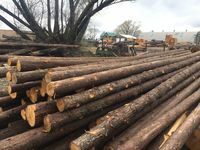 Northern white cedar logs can be debarked by using a machine that peels the bark off 2" to 8" diameter logs or by using a draw knife for larger diameters. Machine peeling leaves a rough surface and if you run your hand over the surface you can get a sliver. 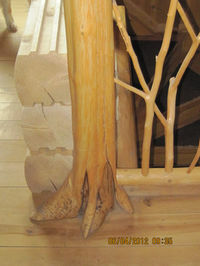 Machine peeled posts can subsequently be machine hewn, which produces a smoother surface, or hand hewn with a draw knife, which gives the post an old fashion look. 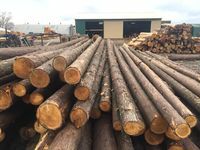 Debarked logs with diameters greater than 8" must be hand hewn with a draw knife. 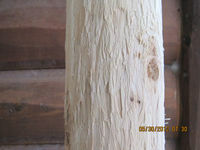 Hand hewn posts are sometimes called German Peeled or Draw Knifed posts. 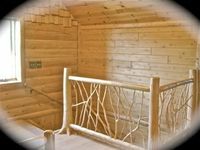 Rails and spindles can be pre drilled with tenoned ends to fit any stairway and are used to build log furniture. 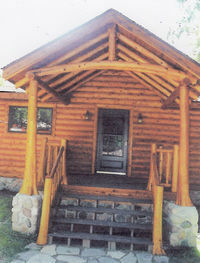 As always, we can custom make anything with our logs or yours. We ship throughout the United States and Canada; we own our trucks. 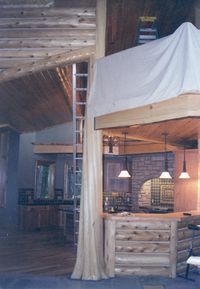 No matter how big or small your building job is, we are here to help. 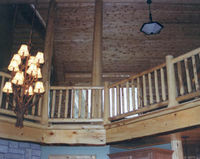 Ask questions, because educated builders and home owners, who talk the log talk, make our job easier. 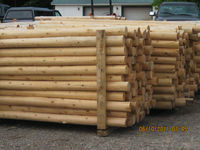 Longer lengths and larger diameters (logs) are available. 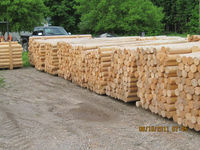 Logs longer than 8' are too large to run through the machine hewner and are hand hewn @ $3.50 per foot. 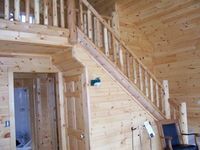 Rails are the top boards. 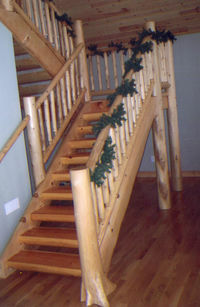 Spindles are the up and down boards. Rails can be pre-drilled. 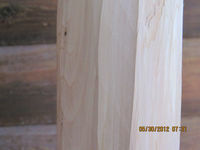 Tenoned spindle ends can be milled to fit pre-drilled rails. For branches/twigs shown in the photos, call ahead. Pricing depends on size and quantity.